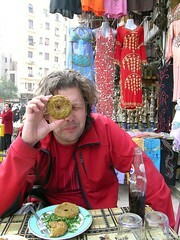 We've hit the first semi-snag in Phil's vegetarian tour of the world - the Middle East. Despite the proliferation of kebab stores in Australia selling felafel, there's a definite meat-focus of the kebabcis in Turkey and Egypt. But salvation appeared at Cairo's Khan El-Khalili bazaar - the most delicious felafel we've had in years, accompanied by plates of tahini, babaghanouj, flat breads and salad. My food highlight of the middle east has been a sweet potato roasted in a charcoal brazier from a roadside vendor. The potato's sugars had partly caramelised on the outside ... soooo tasty. 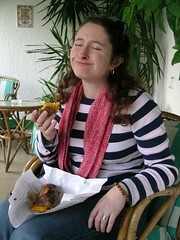 Hmmm... why is there such a focus on food on our travel blog?